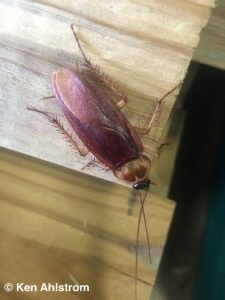 The American cockroach is also called a “waterbug” or a “palmettobug”. It is not native to North America but was introduced from Africa in the early 1600’s. It is a large cockroach, up to 2 inches in length, with reddish-brown in color with a yellow-bordered plate behind the head. They are capable of flying and are attracted to lights. They are quite disconcerting because they are very fast runners. Although occasionally found in homes, they are much more common in large commercial facilities, such as restaurants, grocery stores, bakeries, hospitals, and other businesses where they usually infest food-storage and food-preparation areas, basements, and heating tunnels. During the summer they can be found outside in yards and alleyways. In the US this is the cockroach most commonly found in sewer systems. They can enter homes by being accidentally brought in on boxes and bags. They can also follow pipes from the sewer system and enter homes through drains or toilets. During warm weather mass migrations from other buildings or dumps can occur. At ordinary room temperatures females can live for about 440 days and produce 9-10 egg cases containing 14-16 eggs. Development time from egg to adult is dependent on temperature and ranges from 5 months to more than 2 years.